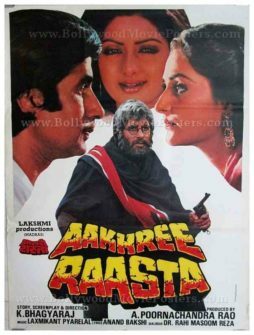 Old Bollywood movie poster of the popular Hindi film, Aakhree Raasta (1986) for sale. This is an actual surviving vintage poster of the 1986 film that featured the greatest actor in Indian cinema, Amitabh Bachchan in a double role. It is believed that Aakhree Raasta was Amitabh Bachchan’s last release before he temporarily quit acting to enter into politics in 1984. Printed and circulated somewhere during the release of the film, this old movie poster was originally designed for publicity of the film but never ended up being used. In the poster, Amitabh Bachchan is seen in two different avatars – young and old. The two actresses Sridevi & Jayaprada appear on the top of the poster. The typography used in this poster is entirely in English except for a translation of the title on the bottom left. Colours as well as typeface used in the hand painted movie title give it a very action-oriented appearance. Aakhree Raasta (The Last Option/Road) is a 1986 Hindi film starring the greatest Bollywood actor of all time, Amitabh Bachchan in a double role. The other stars of the film include Sridevi, Anupam Kher and Jayaprada. The film is believed to be a remake of a 1984 Tamil film with a similar double role plot. The film opened to packed houses in 1986 and turned out to be a box office hit. Aakhree Raasta is believed to be superstar Amitabh Bachchan’s last hit before the decline in his career started. In the film, Amitabh plays both roles as a father and son effortlessly, making this one of the finest double role performances ever.